Wiclax is a powerful and complete race scoring and race timing software solution to manage all your events, easily and efficiently. It's built by and for demanding timekeepers. Illimited local intranet for live broadcast on big screen, tablet and PC. Result server hosted on your own website. No external database engine. Installation, moving and updates extremely easy. ↹ Advanced import and export features to any standard formats. Here at GÃ©nialp, weâ€™ve been professional timekeepers for more than 10 years. Wiclax is the fruit of that experience, and weâ€™re proud to share it with our fellow community around the world. Weâ€™re passionate about bringing the same level of excellence to any kind of race. And weâ€™re committed to constantly challenging our race timing solutions to perform in even the most complex and varied situations. 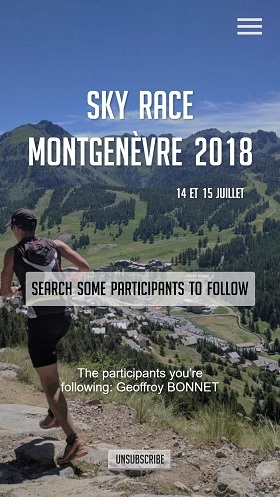 At GÃ©nialp, we pride ourselves in delivering the live, accurate results that race organizers and competitors depend on--every time. Buy Wiclax now, and deliver the same high level of performance to your own clients. Today Wiclax is a complete and highly reliable race scoring and race timing software solution, built with the latest technologies. It combines a powerful set of features with an uncompromising ease of use. Wiclax is dedicated to multi-purpose timing and scoring. You'll feel as comfortable managing a mass marathon than a cycling stage race, or a 24h motor Grand Prix. Wiclax is a tremendous tool for timing running races. Multi start event or big marathon, age groups, result printing and display will be handled smoothly by the software. Wiclax can also connect directly to UHF devices like RFIDTiming, Ipico, Urtime, BRChrono, RaceResult so you can have instant compilation and display of the results. The results broadcast is not left behind with the race live on a tablet for the commentator, rankings in real time on your web site, the display on giant LED screens, the sending of SMS... In 2016 a new option introduces the visualization of race tracks and profiles on map layers or satellite photos. Wiclax also provides a great tool for handling Ekidens. Thriathlon is very demanding because you have many segments to time with multiple starts and different course for any. Wiclax offers a very powerful but easy setting to handle all that and display it nicely on printings and on the web. Of course any kind of duathlon, aquathlon or equivalent will be handled without more trouble. Wiclax is born 15 years ago at road cycling race. So we know well the requirements for good. The software excels in complying with all UCI rules like the tie breaks in overall team classifications. Stages, prologue, time trials and team time trials, mountain and point rankings, lap races, signing lists, vehicle order lists, bonuses and penalties... you'll handle everything with the same ease. And last but not least, you'll deliver the amazing stage summary printout on a single paper and you'll get loved for that. Wiclax is now developped to deal with motor sports lap races. In a single click, you can activate a local broadcast of your event. All you need is a local area network in place, and some devices to access it.  You will typically provide a pad to the race speaker, where he will see live data when some runners cross the finish line - or any split point. Then you can set up some kiosk PCs where competitors or their followers can look for an individual result. A special video mode can be activated for a video wall projection, displaying result information for the last finishers. A perfect option to use with a led screen. In a few simple steps, your race data gets available on your own web site. No technical prerequisite, the application works as a local client. The application uses the latest Web standards. It's perfectly suited for any smartphone or tablet. You can easily provide the languages of your choice. Send SMS or Notifications with result data to followers, instantly after a competitor crosses the finish line or an intermediate split. Wiclax provides a complete module to achieve it easily. In a few steps, you can set up a dedicated web app for an event. People will be able to load and install it, browse information offline, lookup for some participants to follow and receive when they cross a timing point. Everything gets handled in live! 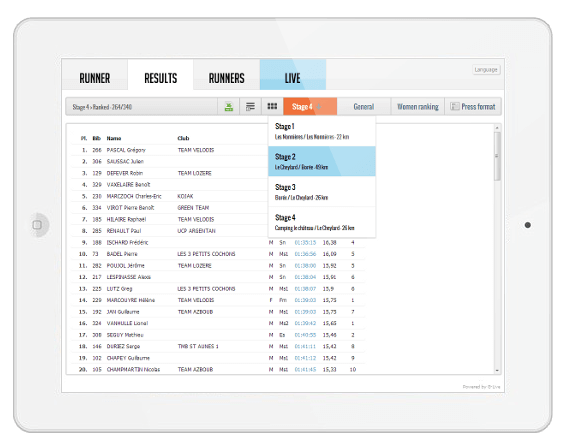 You connect your different equipments or files and a competitor crossing a split point or the finish line is instantly displayed on the tablets with his ranking information. Having different equipment types to use simultaneously? No problem. Having to filter chip ids from another race coming next? No problem. Having a connection loss with the equipments? No problem, the rewind feature is here to recover missing data in a minute. Printouts in Wiclax are not database reports! They can all be customized with pictures and texts of your choice. You can create templates with your sponsors logos in the header or in the footers, that you'll reuse in many events. You'll have fun using the revolutionary thumbnail display to live down boring table grids, as well as to fit a maximum of data on one page. Of course printing results in the very middle of your race with live acquisitions running is never an issue. At any moment during the race, you can look for competitor details in a straight forward way. You just have to press Ctrl+F or move to the lookup area at the bottom of the main window. Then you'll find the competitor you're looking for by typing a few letters of his/her name, or his/her bib number. When located, you'll already know if he's arrived or not, which is a one of the most common questions you'll be happy to answer. Then you can open his complete summary, to know about the last split point he's been seen or have an overview of his results in any of the event stages, know his best lap time in a lap race, etc... You can also open his registration form or his result entry form in a single click, or using keyboard shortcuts. When using the G-Live module, the race speaker will have the same ability on his tablet. And so will anybody if you choose to settle some kiosk devices for race followers. You decide which categories to award, in which order, the number of competitors to award for each of them and for the overall classification. You can decide to exclude duplicates from the category podiums (people already awarded once). You can print all podiums with prize giving or partner information useful for the ceremony. You can check up which podiums may be completed by awaited competitors during the race. Import easily any data. Competitors, results for split points, start or finish line, chip id tables... Import any kind of text file, or Excel and OpenOffice spreadsheets. Wiclax wizards makes all import quick and easy. You can save the import settings that you're using regularly. You can automate some passing files import on a periodic basis, like every minute. You're informed of all anomalies occurring during the import operations. You can set up your event by selecting any of the common used data, like license number, address, email, ... But you can also freely add any data of your own. You can provide default values, and a list of predefined values. This data can be created for registration purposes only, like for instance a T-Shirt size, but it can also be used to compute a specific classification. Can be for example a team classification computed from a custom Company information instead of the regular team. 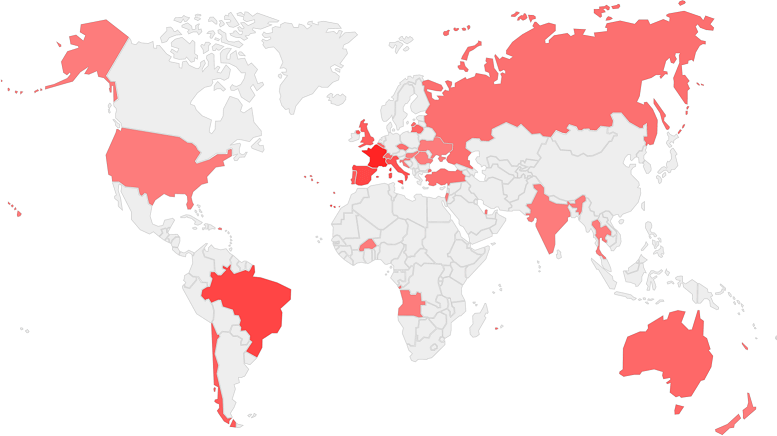 Having an exotic ranking to deliver? You can build and save it based on any filter condition. It will become available for printout, for podiums or for team classifications. Having a 2 days event with 8 races starting and finishing at different times and places? No problem, you'll handle all of them in a single race file, ready to be published in one click. You can assign each race a bib number range, so that a new registered competitor will get assigned his bib number automatically according to his race. Changing the bib of a competitor will propose to update his race belonging in case it's no longer in the race range. You can define as many intermediate time split as you need. Whether they are common to all races or specific to some of them. You can define acquisitions that will feed one or many of them sequentially. Segments are giving performance and ranking information for each discipline. All of that being offered to competitors on your web site where they can check their progressions between the different timing points. 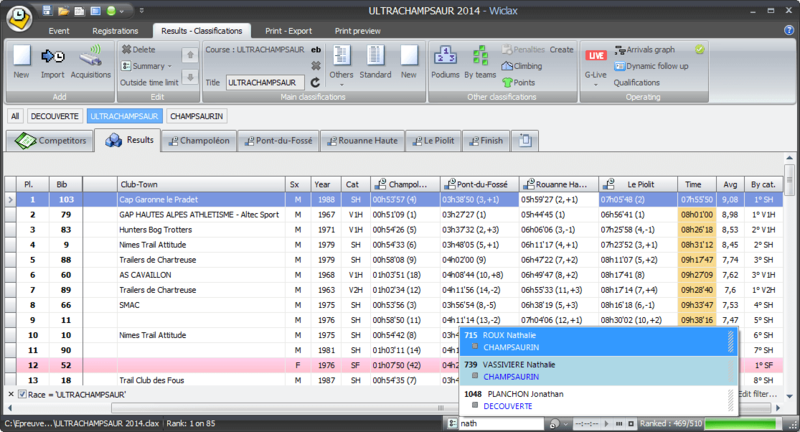 For your stage races, Wiclax instantly generates accurate general classifications. They will be for example displayed in real time on the speaker's tablet on a time trial finish. Wiclax does a great job for time trial races: a rich assistant to build the start lists just as you need or live acquisition of start times if times are not determined in advance. Then the Start module will help you with the countdowns while the G-Live will provide an amazing view of the race suspense that will delight any race speaker. Lap races can be managed as easily, whether competitors have a fixed number of laps to run or have to run for a fixed time (like for 24h races). A bib number assistant can make assignments automatically, based on how many rules you wish. Bib number ranges can be shifted to insert an individual. Bib number ranges can be assigned to each race of your event, for an automatic allocation when registering new competitors. The bib numbers table helps you to locate any free number available for a race. Draw race profiles with altitudes and distances. They will be displayed with competitor results in association with their split points. Wiclax allocates for you any age category based on competitors' birthdate or birth year. You can have over-categories on top of multiple age groups. For the greatest flexibility, age categories can be recomputed at any moment. You'll also be able to manage level categories aside the age categories. Having access to the list of affiliates of your prefered body? No problem to plug it to Wiclax and boost the way you're entering competitor data while minimizing the risks of error. Wiclax can handle files with hundreds of thoushand individuals without affecting performances. You already know that the quality of your registration data makes a good part of your job success. Wiclax helps you for that by providing a data checking feature. You'll find there most of inconsistencies with the genders or the missing categories. You define which criteria to use for the classification computation. Number of runners to consider, number of women expected by team, sum of times or sum of places,... The classification can be computed from the team/club data or from any other custom information. The classification can be computed for the overall event or for each race individually. It can be based on any competitor selection that you'll need to define. 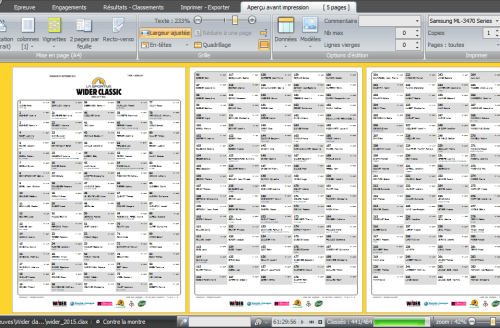 The general team classification can be calculated and printed after each stage. Team time trials can be followed in live with real time calculations. The full software solution can be translated into your desired language. But you can opt for an easy solution that consists in translating only the texts used for output, on printouts or in exports. These can be column captions, classification statuses and so on. It can be ready in a few minutes with the translation tool. You'll feel very comfortable in case your timekeeping business sometime goes beyond borders. The G-Live module is ready to give multilingual support for the result data published on your website. Furthermore, you'll also have the ability to enrich the solution with local data like a list of female lastnames, for automatic gender recognition, or the list of your country's zip codes for an easier participant registration. From a simple tablet or from a PC connected to your local network, you can have somebody working on participant entries while you're focusing on results. Starting from release 8.1, the G-Live module can activate some live data export or broadcast based on your exact requirements. Great for your professional needs like TV overlaying, for instance. Currently able to be set up for file writing and for TCP client or server mode data sending. Having other needs not covered yet? The system is designed for evolutions, and we'll be happy to make it go one step further. To provide our customers the best service and ensure that the solution keeps being enhanced for everyone's benefit, Wiclax is available as a one-year rental pack. This annual fee includes any new version update during the period, and a support assistance by mail or Skype to help you to get started. The license can be purchased VAT free if you're settled outside of EU, or in case you can provide a valid international VAT number (France excluded). The Expert pack is suitable for a club aiming at managing itself the scoring of its races. The software ergonomy make it usable without a big knowledge or experience. If the size of your events is not that huge but you really want to offer a great timing quality, then the Expert pack is for you. See below for a complete list of features included in each pack. Ready to buy? Please gohere on Genialp site to create an account and proceed further. In order to proceed with the Wiclax setup program download, we invite you to fill the form below with your information. If no license is activated the program will be in trial mode, limited only in number of results you can manage on an event.